Next week Scotland will vote to decide whether or not to break free from the rest of Britain and go it alone as an independent country. The referendum has dominated this week’s news, divided Scotland and caused violence on the streets of Glasgow, yet somehow, for the first time since I turned nine and cried as I witnessed Tony Blair walk into Downing Street, I am entirely ambivalent about the result of a British election. I take a passing interest, of course, because it changes Britain and our history forever; the referendum itself already has, no matter what Scotland’s current residents decide. But of the actual result? Less so. On the one hand we have three hundred years of shared history and we are a stronger country united; on the other, England grows sick of Barnet formulae and West Lothian questions, plus each country should have the right to self-determination. If pushed, I have erred in favour of the No campaign but the lure of sticking the boot into British Labour is enough to pull me towards hoping for Yes. The sight of Cameron’s face if Scotland vote for independence would only be topped by that of Nicola Sturgeon’s if the Yes surge crumbles. With just nine days to go neither campaign can say with any confidence that they are going to win, but the biggest risk to the No campaign is probably the support of Eddie Izzard whose previous pet projects include Yes to AV and Ken Livingstone for Mayor of London, both of which failed miserably, although I doubt the revelation that North Korea is backing Alex Salmond was welcomed with open arms either. It took an unexpected poll announcing a sudden surge for the Yes campaign for the British media to sit up and pay attention; Salmond’s previous floundering wasn’t exactly filling columns. 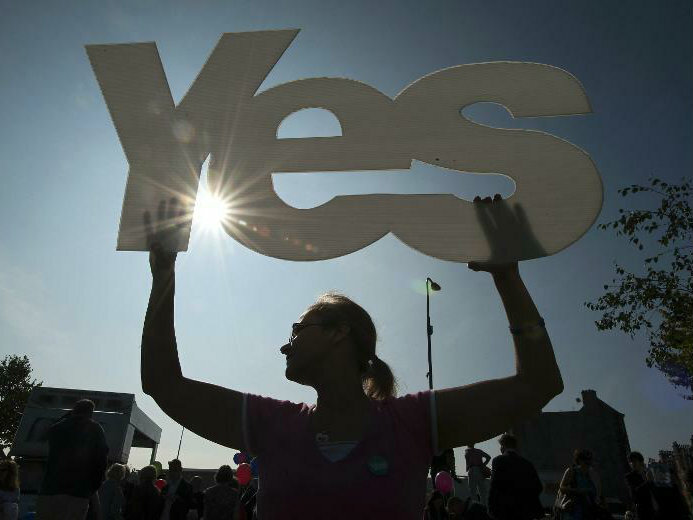 Up until the past week, no one outside of Holyrood thought that Scotland might vote for independence, but since Sunday’s YouGov poll – showing the Yes side in the lead for the first time – both sides have oscillated between first place and embarrassment. Westminster has virtually emptied as the three largest parties panic to retain the status quo: Cameron, so he cannot be blamed for the break-up of the Union under his watch, Miliband because Labour needs Scotland and Clegg because the Lib Dems love a bandwagon and hate freedom. Despite Westminster’s excitement, I still cannot muster even a flicker. But while I care little for the result, I cannot help but think that every Eurosceptic should take a serious interest in the campaign. What we are seeing on the streets of Edinburgh and Glasgow, in the media, across Twitter with increasing vitriol and from the establishment, the entrenched politicians and business, is an insight into what is to come if Britain ever gets a referendum on our future in Europe. The Better Together campaign for Britain is about threats and fear; let’s not pretend the Better Together with Brussels campaign would be any different. While the Yes campaign plays on romantic ideals reminiscent of a socialist Braveheart, the Better Together camp’s arguments are as negative as its mantra: “No Thanks”. The website’s homepage states “the only way to guarantee that we keep the UK pound as our currency is to say no thanks to separation”… “experts expose SNP NHS lies”… “Scottish Businesses say No Thanks to the risks”… “Reality and Risk”. Where’s the positivity, the strong reasons that Britain is better as a whole than it will be if broken into its constituent parts? These arguments are being made and can be found with a few clicks but they are not the fundamental message of the pro-union campaign, which is one of fear, of warning, of uncertainty and of risk. The three largest parties have put their differences aside to unite in favour of a common cause: their own survival and the maintenance of their hegemony of power in the UK. They are relying on undecided voters sticking with the safer option once they reach the ballot box. The combined forces and the funds they wield will probably be enough to push the vote in their own favour. And this is what will happen in 2017, in the very unlikely event that Cameron both secures a parliamentary majority and keeps to his promise. Labour, the Liberal Democrats and a certain wing of the Conservatives under Cameron will join forces with the fiscal might of vested interests to unleash the scare tactics we are currently seeing in Scotland with the aim of preventing Brexit. Whatever side you back to win next week’s referendum, if you care about Britain’s freedom from Brussels then pay attention: if we’re lucky we will face a similar, dirtier fight in three years’ time. It would be foolish to not take notes.